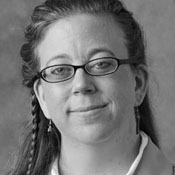 Jodi Smits Anderson is the Director of Sustainability Programs for the Dormitory Authority, State of New York. She is an architect, LEED Accredited Professional in the Building Design + Construction specialty, AIA member, on the Community Advisory Committee for Sustainability for the City of Albany, daughter, wife and mom, and more (ever-changing). She is well involved with the NY Upstate Chapter of the US Green Building Council, serving as Vice-Chairman on the Board, leading the planning of Cultivating Green events in the Capital Region, and as the regional representative to the national level Chapter Steering Committee which answers directly to the national Board Members of the USGBC. She has given presentations on green building and sustainable choices throughout NY State, is a certified G-PRO trainer, eager to train labors and contractors about sustainability and building operations and maintenance, she has worked with a talented and knowledgeable committee on “Greening the Executive Mansion”, and had the pleasure of speaking at Greenbuild 2009 as a panelist on “Becoming a Green Government Guru”. She is currently working with Interagency Councils on several Executive Orders for NYS including one on green procurement and a more recent one, EO #24, on reduction of GHG emissions 80% by 2050. Her goal is to incorporate sustainable practices into as many elements of design, construction and living as possible, and to share whatever she has learned and learn still more from whomever will talk with her.